Before you even take the horse out, take a look in the stall. Tracks in the floor scraped paint, diarrhea, and cracked walls can all be warning signs. Also, take a look at the general appearance. Is he relaxed around you? Look for balance or overdevelopment on one side. A good horse should be alert and responsive without being too shy. Does the horse bite or kick? How is the horse around children? Does this horse “spook?” If so, what makes him scared? Has he ever been hurt and if so, what was the treatment? Did he recover well from the injury? After a preliminary examination, take the horse riding and see how he does under saddle. Watch for his riding habits and how comfortable he is taking direction. 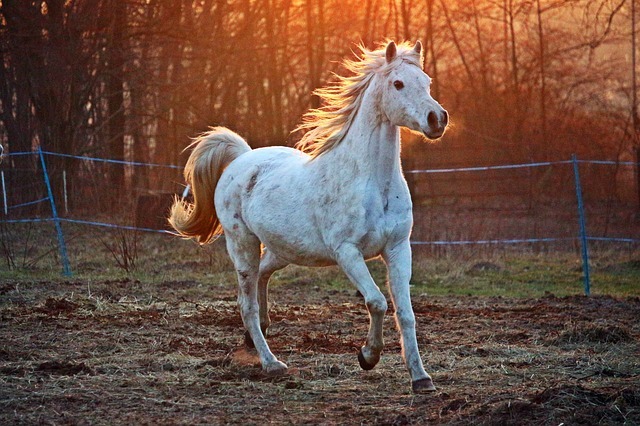 Even five to ten minutes of riding will tell you a great deal about the horse’s personality and if he’ll be a good fit. 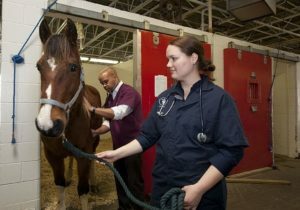 This is an area where your vet will be able to really tell you about the horse’s health, but you can do a preliminary exam on a horse. Start be examining the horse’s head. Check his eyes to make sure that there’s no film and that they respond to movement. Look at the horse’s teeth and tongue for any damage or misalignment. Finally, check his pulse to ensure that it’s regular and strong. The second area to look is the horse’s legs. Look at his joints, making sure that none point in the opposite direction. Horses may also be prone to bony growths near a joint so look for any bumps or lumps around their joints. These bumps may not be damaging but it’s a good idea to ask the owner about them. Be sure to ask the owner if the horse has any problems with lameness or if the horse has been foundered or nerved. Thirdly and finally, review the horse’s health records. Look at the deworming and the vaccination records. If there are none, you probably don’t want the horse. The owner should be able to tell you if the horse has had a negative Coggins test if it’s been vaccinated for West Nile Virus and the date of its last dental exam. These are all signs that the horse is in the best possible health. By taking an objective look at your prospective horse, you have a good likelihood of making the best decision when purchasing a horse. Don’t be afraid to ask as many questions as you can and enlist the help of a trained veterinarian, especially if you have no experience in buying horses.